Farmhouse in the hills not far from Castiglion Fiorentino and Cortona. 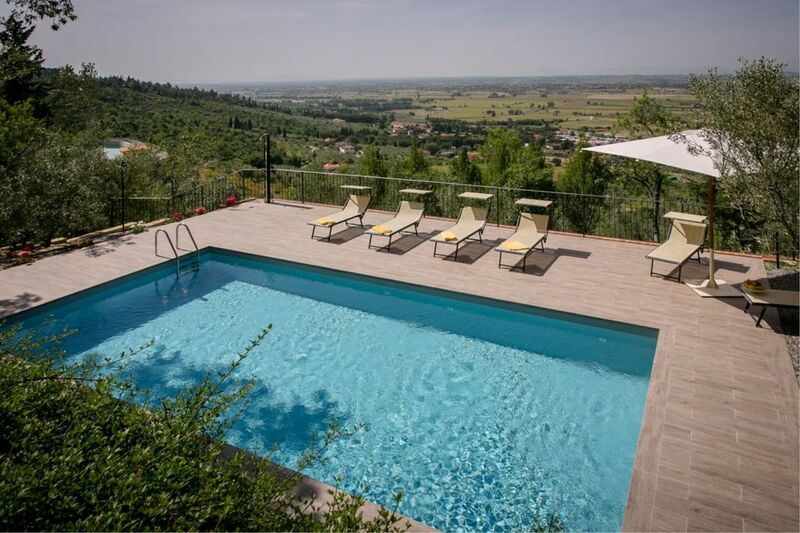 Beautiful rural home placed on the silver hills covered with olives groves between Castiglion Fiorentino and Cortona, in a very panoramic position and a stone's throw away from the magnificent medieval castle of Montecchio Vesponi. The villages of Castiglion Fiorentino (4 km far) as well as the nearby old Etruscan town of Cortona (8 km far), endowed with all kind of shops and services offer many folk events and cultural celebrations in particular during summer time. Garden surrounded by olive trees, almond trees and cypresses. All around the house the enclosed, large and fresh garden shadowed by olive trees, almonds and cypresses and equipped with outdoor furniture, barbecue and wood burning oven, guarantees a pleasant area to relax during hot summer days. Comfortable rustic Tuscan style. The house furnishing is well-groomed and comfortable and fits in with the property features, which is made up of two interconnecting floors either from the inside or from the outside with two separate entrances. At guests disposal and for their exclusive use the beautiful swimming pool (size 5x10 m - depth 1,40 m), situated in a panoramic terrace with amazing view on the Valdichiana. Possibility to arrange trekking and mountain bike excursion with local guide to discover the paths of the area, and also pottery course, painting or cooking classes, and much more to experience an unforgettable holiday in Tuscany. GROUND FLOOR: wide kitchen-dining room with fireplace, small bathroom with shower, double bedroom. FIRST FLOOR: with access either through internal wooden staircase or external staircase with typical loggia, living room with fireplace and single sofa bed, study with single sofa bed, double bedroom with small private bathroom with shower, double bedroom, double bedroom with added single bed, bathroom with shower. EQUIPMENT: washing machine, dish-washer, microwave, DVD player, SAT TV, freezer, filter coffee maker, highchair, oven, Wi-Fi Internet access. [Counter comment from the owner] During their stay the guests did not inform us about a problem with the hot water. We will check and make sure everything works fine. Prachtige ligging. Fantastisch zwembad en buitenkeuken. Paar minpunten: trein die regelmatig door de vallei rijdt hoor je goed. En de douches zijn erg klein. Maar wat hebben we ontzettend genoten van il condottiero en eigenaar is erg vriendelijk . [English translation courtesy of Easy Reserve] Beautiful location. Fantastic pool and outdoor kitchen. Couple of negatives: train runs regularly through the valley yand you can hear it. And the showers are very small. But we thoroughly enjoyed il condottiero and owner is very friendly.